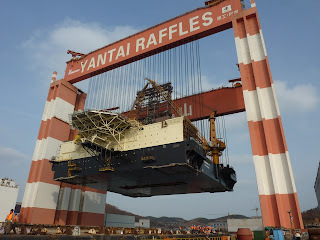 Taisun is the world's strongest crane and has a safe working load of 20,000 metric tons. Taisun is designed and built for the installation of very large modules in semi submersibles and FPSO projects and located at Yantai Raffles Shipyard in Yantai, Shandong Province, China. The crane holds the three heaviest lifts of all time: 20,133 metric ton, 17,100 ton and 14,000 ton.